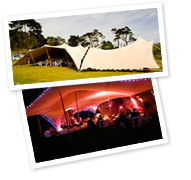 The Function Warehouse has a selection of Freeform Bedouin style tents available in a variety of colours and sizes. These tents are scientifically designed using weatherproof fabric, which allows us to transform any occasion into an unforgettable event. These tents can be erected in a number of combinations, quickly and easily and our experienced riggers will offer advice and design, dependent on the location. From small, intimate celebrations at home to more complex installations we can accommodate all your guests under one roof. The tents form a splendid backdrop for our stylish lounge furniture so if you need an area to relax in or need to add ambience to a venue, look no further than our range of highly maintained ottomans, coffee tables and suites. We have styles that will suit almost every seating arrangement and theme.